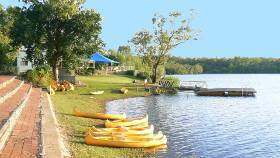 Lake Bennett Resort allows public access for swimming and canoeing on the lake, with accommodation, bar facilities, restaraunt and a sundeck and swimming pool for guests. The Lake covers about 80 hectares in a scenic wilderness valley and is located about 80 k's south of Darwin. 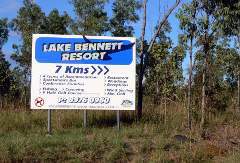 Look for the well sign-posted turn off on the east of the Stuart Highway and a sealed road through low hills will take you to the resort. 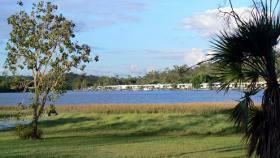 The low dam wall and grassed banks make a pleasant setting for a swim or a paddle in one of the hire canoes. This is a man made freshwater lake and crocodiles are not a problem. or two bedroom fully self contained bungalows. A sealed road continues from the resort around most of the lake providing a good view of this picturesque setting. There is plenty here for the keen photographer, a 2.5 km bushwalk, lots of birdlife and a nine hole mini golf course is available for guests. Guests can also hire fishing gear on an hourly or daily basis. 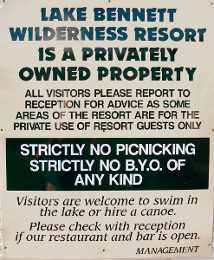 The resort also caters for weddings, conferences and other group activities, and while a casual swim is permitted, the BYO and picnicking restrictions obviously do not encourage the casual visitor. Return from Lake Bennett to Enjoy Darwin Home.